« Announcing: Veganic CSA from Animal Place! Box #1: Oodles of Spring Greens! We hope that you enjoy the very first veganic CSA box from Animal Place! 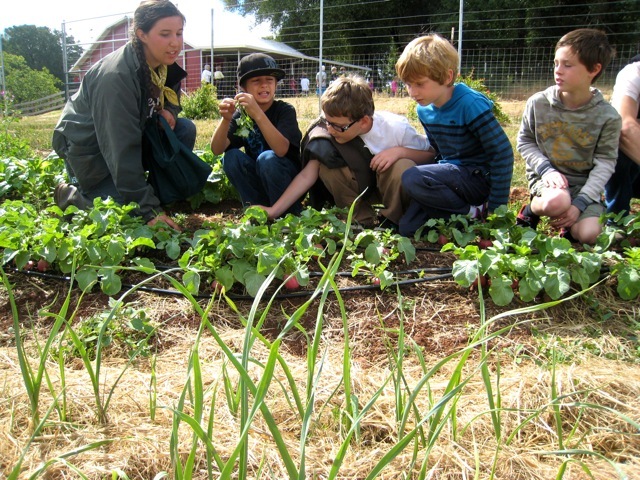 Farm intern Rebecca Wolf shares the plant love with 3rd graders as part of the Farm to School program. Fennel – the sweet bulb and stems can be thinly sliced in a salad. Try out the fronds to garnish any meal! Beets – the root can be roasted, boiled or grated (raw) for a salad or even picked (see recipe below). Save the stems from beets and chard for a rainbow sauté! Dandelion Greens – we threw these in as a bonus. And yes, we grew them on purpose. The bunnies love them. Try them if you dare! They can be quite spicy, juiced, sautéed or even raw. Hot, cold and hot again! Dramatic swings in temperatures have been a challenge for our confused plants. Some of our spring crops “bolted” in the swelter, producing a flower before the crop had been harvested. Just days later, many of our tomato plants were lost in an unexpected and unforecasted frost. But not to fear: there are just enough survivors to feed our CSA members. I hope that you enjoy the first box and the many more to come this season. The whole batch fits nicely into a quart-size jar. Place beets in large saucepan and add enough cold water to cover. Over medium-high heat, bring to a boil. Reduce to a simmer and cook for 30 minutes or until beets are fork-tender. Strain beets in colander and rinse with cold water until cool enough to handle. Peel beets. Slice into 1/4″ rounds. 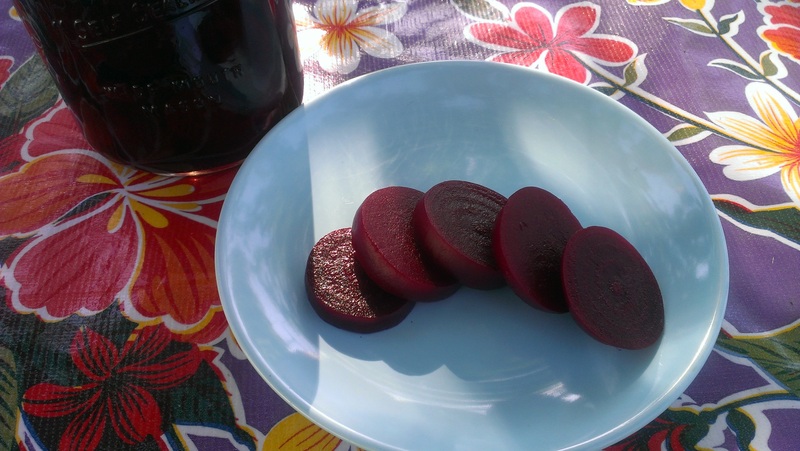 Place beets into a quart-size mason jar or bowl. In large saucepan, (Just use the same one! No need to wash in between.) combine vinegar, water, sugar and cloves. Heat over medium until mixture starts to boil. Remove from heat and pour vinegar mixture over beets. Let beets sit until they are room temperature and refrigerate overnight. Enjoy! Pickled beets should keep in the fridge for about a week. Do you deliver boxes of fruits + veggies to peoples homes? If so do you deliver to Mill Valley? Then I’m interested! Thank you for your interest! I wish that we could deliver to Mill Valley, but that’s a little far for us right now. We currently have a drop-off location in Sacramento and in Grass Valley here at the sanctuary.